*My beautiful girlfriend is a Diane Lane devotee, particular when it comes to that famous cinematic genre, Diane Lane Gets Her Groove Back, as well as that genre’s prominent subgenre, Diane Lane Going to Pretty Places. And as I often do in cases where I watch movies with no intent of actually writing anything about them, when I watched “Under the Tuscan Sun” with my beautiful girlfriend recently for mere enjoyment, I still felt compelled to offload a little drivel about it, with a bonus “Under the Tuscan Sun” track coming tomorrow. “Under the Tuscan Sun” opens with the perfect life of writer Frances Mayes (Diane Lane) being thrown out of whack when she discovers her husband is having an affair. So Frances’s pregnant pal Patti (Sandra Oh) offers her Tuscany vacation package which Frances rejects before she reconsiders in the face of gloomy life moments and goes. 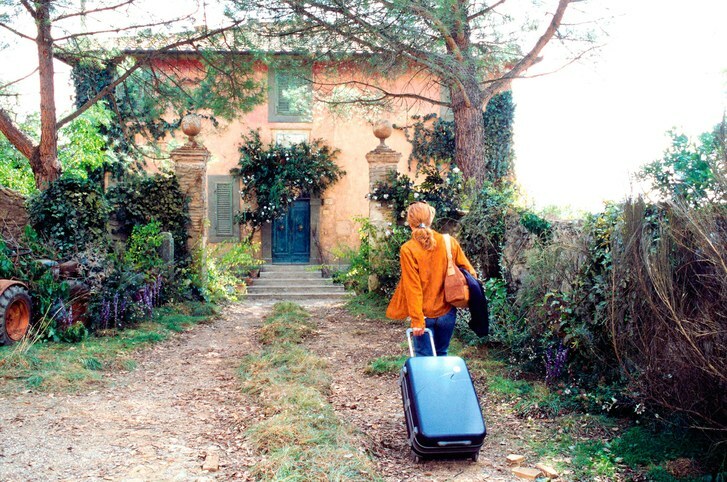 In Italy she seems ready to simply unwind until she goes all in on by purchasing a rundown ramshackle villa on a whim. That is how “Under the Tuscan Sun” goes. Say anything you want about it but do not say that writer/director Audrey Wells, who adapted the film from the bestselling book, is not committed to the story reversal, transitioning from Sad Diane Lane – usually accentuated with drab sweaters and a messy ponytail – to Happy Diane Lane – usually accentuated with elegant dresses and her hair up and in curls – and vice-versa so frequently that you are surprised Diane Lane doesn’t wind up with whiplash. But then, this commitment to reversals scene to scene seems to cause Wells to miss the prominent through-line of the villa itself. When Frances purchases the house and hires a motley crew that mostly cannot speak English to rehab it, this comes on readymade as the preeminent plot point. That Frances’s former life was perfect is not so much illustrated as simply assumed, and that it is then instantly thrown out of whack, while a necessary narrative device, sure, also suggests that a Perfect Life is only tenable with some Hard Work. And this house renovation would seem to suggest said Hard Work. Yet after initially devoting time to it, like when a fairly massive mishap leaves a gaping hole in a wall, the refurbishment mostly falls by the wayside, just sort of commented upon and glimpsed in passing before, suddenly, without quite understanding how they got there, the house is postcard worthy. I’m sure that somewhere lurks a more cinéma vérité version of “Under the Tuscan Sun”, perhaps with Trieste Kelly Dunn as Frances Mayes, where the focus is almost strictly on house rehab and the director visually connects home restoration with the restoration of the soul. That might be a great movie! It is not this movie, which glosses over considerable real world details to embrace fantasy. Indeed, when Frances meets an extravagantly romantic Italian and he says something extravagantly romantic things to her she incredulously declares “It’s just that’s exactly what American women think Italian men say.” That perhaps speaks to the American proclivity for placing absurd romantic projections on anything, which is also worthy of exploration, sure, though Wells prefers to merely raise that objection and then overrule the objection itself. No, if “Under the Tuscan Sun” is about Frances sort of finding herself in the midst of a fantasy come true then it also becomes about Diane Lane trying to will this fantasy to life. You wish she got more movie star moments, like the one her English friend gets when she’s dancing in the fountain like it’s “La Dolce Vita”, even if you wish that moment would be tailored strictly for Diane Lane, wholly original unto herself. Then again, maybe Lane doesn’t need nor want a movie star moment. She does well in comical moments, usually opposite Sandra Oh, a wonderful scene partner for her whose “What’s Happening?” face is firmly on point, but she does even better selling typical rom com bunk, like when her character’s relationship with the aforementioned extravagantly romantic Italian lightly combusts, a moment she plays like someone who can’t quite come to grips with this happening because she’s not quite sure she deserves love in the first place. She does deserve of it, of course, just as everyone does, and the way she brightens in the company of an untraditional family of house laborers and new friends and old friends makes you realize that she has realized this truth. That makes it somewhat disappointing that the script adds unnecessary punctuation in the form of some nondescript new guy that turns right up at the end for Frances to fall in love with, underlining the myth that true happiness only arrives in the arms of another. But, whatever. This was just icing on the cake, not the point, because by the time it happened, Diane Lane had already convinced me that Frances Mayes was going to be ok.